This micro-computerized Zojirushi NS-ZCC18 model remains one of the best 10 cup rice cooker models when comparing great rice quality & performance all at a competitive price. The unit can prepare up to 30 cups cooked white rice and features a fool-proof water level measuring gauge inside the inner bowl. In combination, the rice cooker also allows users to select from a variety of specific rice types which are white, sushi, brown, mixed, rinse free, and even porridge. This process is simple and requires following the correct measuring guide along with the press of a few buttons. The quality, flavor, and texture of the rice will be consistently moist and fluffy after each use. In addition, for cooking white rice, folks can choose from 3 different textures; regular, hard, or soft. Zojirushi Fuzzy Logic is on Board! 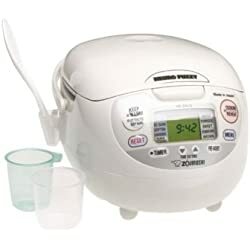 What helps make the Zojirushi NS-ZCC18 better than the average rice cooker is its micro-computerized internal monitoring, also known as Fuzzy Logic. This means that instead of just simply boiling the rice, the unit will sort of “pay attention” on how the selected rice is cooking making fine temperature and cooking time adjustments when needed. This also makes up for slight errors in measurements. Adding that along with a spherical inner bowl designed to distribute even heat assures that folks get an above standard batch of rice without the guess work…especially with brown rice which can be a challenge to get just right. Another plus folks should find helpful is the programmable timer feature allowing folks to start the unit in the morning and having a bowl of moist ready-to-serve rice when returning from work. This Zojirushi NS-ZCC18 Fuzzy Logic rice cooker model comes with two measuring cups, (one for rinsing rice) a spatula, spatula holder which attaches to the back side of unit, and manual. As mentioned in the Cons, given that this Zojirushi 10 cup rice cooker requires a battery change after 4 years may lead some to choose another unit…however. Based on all of our rice cooker research, most, if not all micro-computerized units require this change. A simple tip to keep in mind is that keeping the unit plugged in will increase the lifespan of the battery. Also note that this battery is what keeps the clock running when the unit is unplugged and can operate fine without it. It also holds the units memory in case of a short power outage when it is cooking. Overall, for the benefits and features, along with the quality rice it will produce makes the Zojirushi NS-ZCC18 a great buy! Also compare with the Sanyo ECJ-HC100S and the Panasonic SR-NA18 before buying.